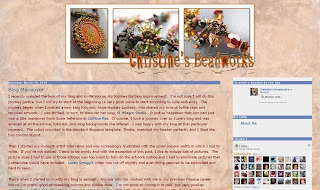 I've just read the most wonderful post about a blog makeover I did for Chistine at Christine's Beadworks, and was so touched that I just had to share! Click on the link to read the full post. What a glowing testimonial - thank you so much. It looks great Susie......you deserve the kudos! You are a true artist with a keyboard I am sure an overal artist. Love what you did with Anne's and Christine's blog. I also apprecaite your hint and tutorials it has helped me quite a bit. Bravo to you. Love your work. Bunny - thanks so much, and so glad you found the tutorials helpful. Very nicely done, Susie. You are the most generous of bloggers!!! Every word was well deserved Susie, I wrote my first new post today utilizing everything you taught me and the feedback was wonderful. Thanks again!